Sound good? 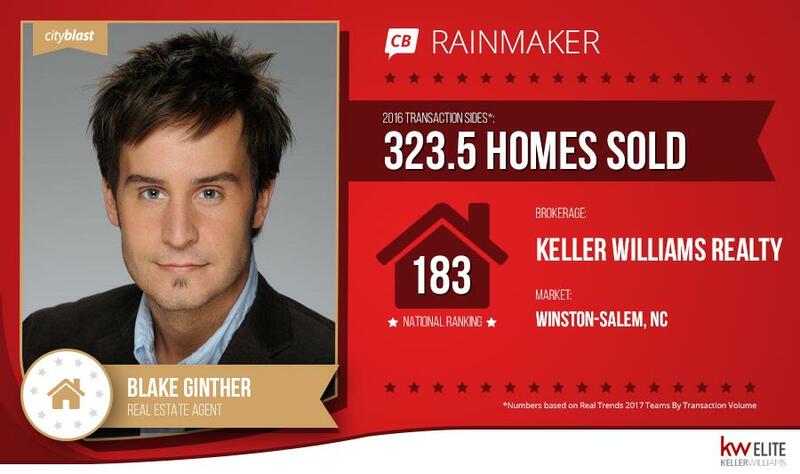 Without further delay, here’s one of the top 1,000 ranked Realtors® in the nation, Blake Ginther of The Ginther Group, with his top real estate marketing tips and tricks! 1) Tell us what market you work in, and how long you’ve been in real estate. I have been in real estate for 15 years and have worked all over the Triad. My team and I work 45 minutes in any direction from Winston-Salem. 2) Tell us how you got started in real estate? As I was growing up I always wanted to be an architect. I drew hundreds of houses starting from the age of six, but you could say my professional career began in New York City at the age of 23. That’s when I moved to New York City initially to focus on a career in the performing arts and was offered the opportunity to work at Ardor New York, a real estate company. 3) What drew you to the real estate industry? 4) When you began your career, what was your biggest challenge? Probably what any agent would say: breaking through and finding consistent ways to generate business. 5) What role does technology play in your business? For the past eight years or so, depending on the market that you are working in, the internet has changed our industry. In the past few years, it is now the primary way your clients will first view our business. Embracing internet-based technology in all forms is key to a successful business. Being excited about what is coming next, not being afraid of it. 6) What are the top tools you couldn’t live without? A powerful and fully utilized CRM. Talented people. 7) If you could give just one tip to yourself as a new agent, what would it be? Be equally- or more- purposeful with your existing clients as you are when working with new clients. 8) What’s the best secret strategy you’ve ever discovered? I am not a huge believer in “secret strategies” but I do think that many agents have been slow to realize the value of client events. If you are not doing them, you are missing the boat. 9) What’s the best way to build a long-lasting client base? An organized and powerful CRM that will keep client information readily available to keep in touch with them, include them in client events, let them know you continue to be there for them. 10) What is the biggest challenge that prevents others from becoming a top producer? Being consistent. I believe most agents can commit to lead generation habits and coming to work even when there is not much on the calendar or the bank account for a short while, say the first 6 months they are in business. However, it is also true that a staggering amount of agents cannot get over that 6-12 month hump in this industry. That is when consistency is a more difficult path to follow. 11) How do you think mobile devices have changed the real estate marketing world? As I touched on earlier, in the last few years people rely on the instant gratification of having the internet in their hands via smartphones. In one sense, that is great as we market heavily online. But it has also greatly impacted their expectations. People now expect a nearly immediate response and the data they are finding online provides them with a false sense of confidence very early in the process. 12) How do you think social media has changed the industry? From a knowledge standpoint: minimally. From a marketing standpoint: sizably. 13) What’s your best go-to method for selling a listing fast? This comes back to the “no secret sauce” theory I have. It’s relatively basic, in that you first have the home in optimal showing condition, then have the home priced in line with the comparables of the last 6 months and then market the home fully; most especially online and with high-level professional photography and fully utilize social media when doing so. 14) How do you generate new leads? Through your past clients, friends and sphere by keeping in touch with them regularly or through marketing efforts. New leads stem almost always from that. 15) How do you feel about competition between agents? Admittedly, I am an incredibly competitive person. That being said, I feel like agents are most competitive with themselves. 16) What’s one technology that doesn’t exist yet that you would love to see emerge in real estate marketing? I think that it is coming in our market, but technology offered by MLS that supports the team based real estate model is critical. More and more agents are interested in entering our industry using as part of a team. We should be welcoming of technology that reinforces this trend. 17) What separates a good agent from a great one? The ability to keep your emotion in check while still being empathetic. 18) What’s your best advice for marketing real estate services to Millennials? First of all, I want to say that every generation suffers from generalizations and stereotypes that can be exaggerated. However, Millenials do have higher expectations in regard to response time and adhering specifically to whatever form of communication they prefer. It is important to recognize and respect that. 19) What do you think is most important when developing an online real estate marketing presence? Reviews, collecting many great reviews. 20) What words do you live by? Be honest, most of all with yourself. 21) What’s your endgame? What are you working toward in life/real estate? As my wife and I are about to welcome our second child into this world, my legacy is becoming more important to me. Building something for my children and helping others to do the same for their families. Want to Become a RAINMAKER Yourself? Sign up for our free 52-week RAINMAKER series and we’ll deliver the secrets of the best real estate agents in the world right to your inbox! Or sign up for a free trial with CityBlast and solve all of your social media needs.